However, we Jews have been thinking a lot about trust and safety recently after the little boy, Leiby Kletzky, was murdered in Brooklyn, after he asked for directions from a man who looked legit, like someone who held the same values. Similarly, Airbnb had to revise its policy after several hosts complained of paying guests who trashed their homes and stolen personal property. A few days after my return home, I received a letter from Brian Chesky, the founder of Airbnb, stating their commitment to supporting their hosts with a newly instituted guarantee coverage for up to $50,000 in damages from paying guests. So, how do we deal with the issue in my community? Some people would say we’re crazy for opening up our homes to strangers. I have even placed guests in local homes while the owners were away. In one incidence, the guests were coming from London for a bar mitzvah, they later connected with their hosts, and the shul family’s daughter was able to stay with them while she was doing her semester abroad. In a dramatic example of the Biblical quote from Kohelet (Ecclesiastes) that can be translated as “Cast your bread on the waters, for you shall find it after many days”, this same host family found themselves in need of hachnasat orchim (welcoming guests) this summer when they made a wedding for one of their daughters and their machatanim (parents of the other member of the wedding couple, in this case, the groom) asked for an empty house, because the groom’s father is wheelchair-bound and he has to use a hospital bed. To my amazement, with my very first phone call, I was able to make the shidduch (match). Another example came four summers ago, when I got a frantic call on a Friday afternoon. A woman was stranded at the airport because her plane had been delayed and she needed a place to stay for Shabbat. I made the shidduch, then because her luggage had been routed to Boston (where the rest of her family was headed), she wore her host family’s daughter’s power suit to shul the next day. The only marvel to me was that she, a mature woman in her late 50s, was the same size as her host family’s 19-year-old daughter. 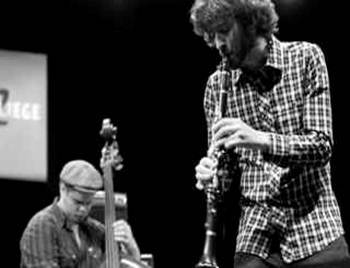 Who Infuses Klezmer and Jazz Music With An African Beat? The e-mail came on a Friday afternoon via my publisher. It was the cultural attaché for the Israeli Consulate here in Philly and she wanted me to cover the event they were sponsoring at the Art Museum as part of its Art After Five program. The problem? The concerts are held on Friday evenings and I observe Shabbat the traditional way. When I told my family about the prominence of the guest artist, Israeli-born Oran Etkin, they encouraged me to cover the event. What I ended up doing was to complete my Shabbat preparations by 5, drove down to the Museum in a pouring rain, attended the concert, and was back home and ready for candle-lighting before any other member of my family. The interview with the soft-spoken artist was conducted the following Monday by Skype. What excited us was the reputation Oran has as a clarinet player and a teacher, lauded by New York Times music critic Ben Ratliff and PRI‘s internationally syndicated radio show, Afropop Worldwide. His music fuses traditional West African (Malian), Jewish, and Middle Eastern melodies with modern jazz, creating what The Boston Globe dubbed a “hypnotic balance between straight-ahead jazz and world music.” He’s performed across the world with musicians ranging from jazz guitarist Mike Stern to rapper Wyclef Jean. His music has been featured on a Grammy-nominated album, Healthy Food for Thought, alongside tracks by Russell Simmons, Moby, and Sweet Honey In the Rock. Oran is also an innovative teacher and the creator of the popular Timbalooloo music classes. His first CD for children, Wake Up, Clarinet!, has won awards from the Parents Choice Foundation, NAPPA (the National Parenting Publications Awards) and the Oppenheim Toy Portfolio Gold Seal. It features Jason Marsalis from New Orleans on drums, Fabian Almazan from Cuba on piano, Curis Fowlkes from Brooklyn on trombone, and Garth Stevenson from Canada on bass. His debut album, Kelenia,was recognized as the “Best World Beat Album” at the Independent Music Awards. Oran has performed at the Blue Note, Central Park SummerStage, Joe’s Pub, the United Nations and numerous other venues in the United States, Europe, Africa, the Caribbean and the Middle East with musicians including Jason Marsalis, Wycliffe Gordon, Lionel Loueke, Mandingo Ambassadors, Airto Moreira, Toumani Diabate, and Killah Priest of the Wu-Tang Clan. How did a Jew, an Israeli, learn to play traditional African music from Mali? Oran had a teacher in college- his alma mater being Brandeis- whose uncle played the kora, also known as the African harp or lute. This teacher, Joh Camara, brought Oran to visit his family in Mali and Oran fell in love with the people and their music. The two African musicians who’d performed at the Art Museum had the same surname, Kouyate. Did this have a cultural significance, as Cohen connote priestly descent for Jews? Yes, the West Africans have an oral tradition by a griot or a jeli who relates the history of their people through music and song. People bearing the Kouyate surname are descendents of the original griot family. They traditionally perform at milestone ceremonies and Oran has been privileged to participate in some of these festive occasions. Richard Freedman, professor of music at Haverford College, reminds me that these griot lineages have broken down somewhat in the wake of sound recording (which allows others to copy the style), and of course, of social change in Mali, emigration, etc. In fact, you can even study kora in the United States! Two non-Western instruments were performed at the concert– in addition to Oran on the bass clarinet and saxophone and Marcos Verela on the double bass– the balafon and the calabash. Yes, you read correctly- it was a giant egg-shaped half gourd, measuring almost two feet in diameter with a hardened shell that was about half an inch thick. The drummer, Makane Kouyate, produced such a diverse blend of sound with his instrument that I was sure he had a steel drum hidden behind it. No, it was only the calabash with a microphone tucked underneath on a regular table. When the drummer beats the instrument from the side, it evokes a click sound, and when he bangs it from the top, while standing, it sounds like a bass drum. Played by Balla Kouyate, the balafon is a percussion idiophone of West Africa and it looks like a wooden xylophone. It was carefully and lovingly made by its owner, as these musicians take pride in making their own instruments. The drummer had also stretched goatskin for his other drum, the djembe. I learned from Wikipedia that according to the Bamana people in Mali, the name of the djembe comes from the saying Anke djé, anke bé which translates to “everyone gather together in peace” and defines the drum’s purpose. The percussionist had his two young children sitting contently up front behind the “stage,” a cleared space at the bottom of the grand staircase inside the Museum, with a huge cloth curtain drawn across the back of where the musicians performed. Oran confirmed that the balafon player was their father, noting that this was “the natural way of understanding music.” When children learn at a young age, music comes to them naturally; they do not have to learn the rules as one has to endure learning the grammar of a foreign language. With his Timbalooloo classes, the next generation is being exposed to world music with “real people playing real music, attending to each other,” and in the process, they learn to appreciate each other through their music. For the concert, Oran wore a slim black jacket over a collared white short-sleeved shirt (which was exposed when he took off the jacket when the music got “hot”) and jeans. The bassist wore black, but each of the two Malian musicians wore a blue or gold flowing wide-sleeved African robe called a boubou or a bubu. Why did Oran not wear something similar? It would not be authentic. Oran elaborated thus: they understand and respect each performer’s own identity and integrity. 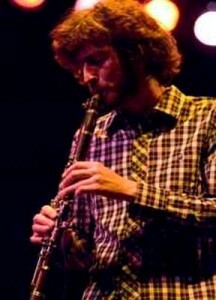 According to Professor Freedman, “They are mixing the traditions while attempting to preserve the uniqueness of each layer.” Oran continued, “It adds more value when meeting other musicians when you bring who you are and make something new.” It enables a wider message. While Oran is not observant of Jewish religious tradition, he is a modern-day Israeli. Hebrew was his first language and he still speaks it with his family. In addition to language, he claims an Israeli identity in the way he relates to other people, a more casual way of friendship than is demonstrated by Americans, who do not drop in on their friends un-announced. He has felt more at home with other immigrants, through their multiple identities. As with music, so it is with his social life. Before his maternal grandmother’s death when he was eight, he and his elder brother recorded her memoir. They made 10 audiocassettes of the family’s oral history about the uncle who left Poland/Russia for Ethiopia (and became close to the Emperor Haile Selassie) and she who’d emigrated alone to Israel in the 1930′s. The grandmother, Mina Nadel, later earned a doctorate at the Sorbonne and became head of the biology department at the Weizmann Institute of Science in Rehovot, Israel. Oran plans to write music one day based on her stories. Was there musical talent in his family? We do not know if it was so further back in time that the Etkin clan was musical, but in his immediate family, there are no professional musicians. His mother played the piano at home. His father played no instruments but he was very musical and he sang around the house. He taught him the importance of melody, said Oran, as “jazz musicians can get so caught up in the notes that they get away from the melodies.” He was obsessed by Louis Armstrong from the age of nine and he discovered jazz on his own. His parents then took him to New Orleans to hear the real stuff in his early teens. Oran also has a sister who’s much younger by 10 years. In caring for her and teaching her how to read and do math, she taught him how to teach. His playfulness and inventiveness come across in his children’s CD. Teaching is in the family: His brother, Amit Etkin, has both M.D. and Ph.D. degrees, and is an Assistant Professor in the Department of Psychiatry and Behavioral Sciences at the Stanford University School of Medicine. Oran’s goals are to play more and more music. A bachelor, he likes to wake up and make music with people whom he likes and trusts. He will continue to tour and meet people who are interesting to him socially as well as musically. His Timbalooloo ventures will also expand, with more CDs and also children’s books. Watch for news of his proposed television program and you can check out his websites, www.oranetkin.com for the jazz and world music (including Kelenia), and www.timbalooloo.com for the program for children. He has taught other people his pedagogical method and when touring, he also teaches classes on site. Parents hear by word-of-mouth and they gather their children to meet him around the world, whether it be in Paris or Los Angeles for the Grammy awards ceremony. My 2-year-old niece and her family will be moving to Edinburgh, Scotland this fall, so I hope that Oran would plan a gig there. Kelenia, the title of his debut album, means “the love between people who find each other.” Today is the Fast Day of the 17th of Tammuz and as we Jews begin the Three Weeks of semi-mourning culminating in the saddest day of the Jewish calendar, Tisha B’Av, the rabbis remind us that the ancient first Temple in Jerusalem was destroyed by sinat hinam, senseless hatred. May the trust and acceptance that comes through a love of shared music inspire us for a future of peace.